Statement piece. 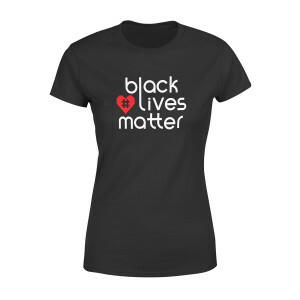 I bought this t-shirt because I have not been on the front lines at protests since 2016. I was on the website looking for information about a chapter near me and checked out the shop section. I originally wanted the wristband so that I could it wear everyday with anything, including business attire. I bought the t-shirt too because it's dope. Fits great, true to size, great quality cotton, tagless brand, and washes well in cold water. In short, an easy way to support, a great t-shirt, and a good way to rep when you are or aren't on the front lines. I am a Kindergarten teacher in San Francisco, CA. I wore my shirt to school the day after I got it, and one of my student's mother's wanted to take a photo of me in the shirt with her son. That was enough for me to know I only wish I had bought one sooner. The quality is great, and it fits nicely, which I appreciate. The writing is clear enough that my beginning readers can read it, so that is awesome!